^ a b Goldman, Jerry, ed. (October 8, 1997). "The Cuban Missile Crisis, October 18–29, 1962". History and Politics Out Loud. ^ Boyland, Vista; Klyne D. Nowlin (January 2012). "WW III, A Close Call". The Intercom 35 (1): 19–20. ^ a b c Kohn, R. H.; Harahan, J. P. (1988). "U.S. Strategic Air Power, 1948-1962: Excerpts from an Interview with Generals Curtis E. LeMay, Leon W. Johnson, David A. Burchinal, and Jack J. Catton". International Security 12 (4): 78–95. ^ Reynolds, K.C. "Boarding MARUCLA: A personal account from the Executive Officer of USS Joseph P. Kennedy, Jr". Retrieved June 22, 2010. ^ Helms, Richard (Deputy Director for Plans, CIA) (January 19, 1962). "Memorandum for the Director of Central Intelligence: Meeting with the Attorney General of the United States Concerning Cuba". ^ "Chronology 1: September 28, 1962 to October 26, 1962". The Cuban Missile Crisis, 1962. The National Security Archive. Retrieved April 9, 2011. ^ "Department of State Telegram Transmitting Letter From Chairman Khrushchev to President Kennedy". The Cuban Missile Crisis, October 1962. John F. Kennedy Presidential Library and Museum. 26 October 1962. Retrieved 9 April 2011. ^ Brandon, Henry (October 28, 1962). "Attack us at your Peril, Cocky Cuba Warns US". The Sunday Times (London). ^ Goldberg, Jeffrey (September 8, 2010). "Cuban model no longer works, says Fidel Castro". BBC. ^ Baggins, Brian. "Cuban History Missile Crisis". Marxist History: Cuba (1959 – present). Marxists Internet Archive. Retrieved May 7, 2010. ^ Christopher, Andrew (March 1, 1996). For the President's Eyes Only: Secret Intelligence and the American Presidency from Washington to Bush. Harper Perennial. p. 688. ^ Pocock, Chris, 50 Years of the U-2: The Complete Illustrated History of the 'Dragon Lady', Schiffer Publishing, Ltd., Atglen, Pennsylvania, Library of Congress card number 2005927577, ISBN 978-0-7643-2346-1, page 406. ^ Frey, Jennifer (January 14, 2007). "At Yenching Palace, Five Decades of History to Go". Washington Post. Retrieved December 27, 2008. ^ Gibson, David R. (2012) Talk at the Brink: Deliberation and Decision during the Cuban Missile Crisis. Princeton, NJ: Princeton University Press. pp. 135–56. ^ "The Submarines of October". 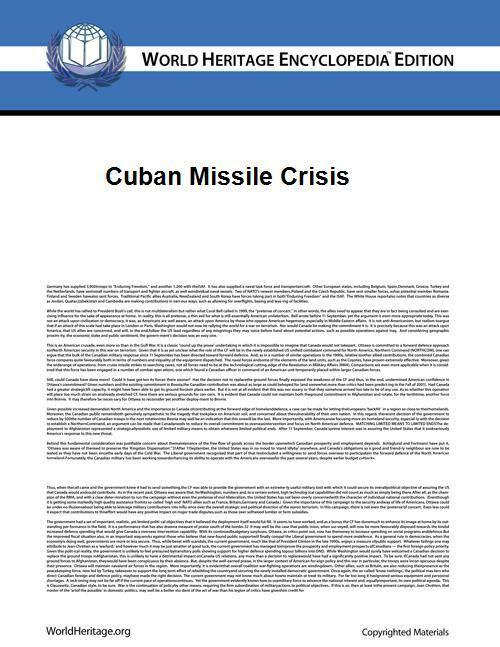 ^ "The Cuban Missile Crisis, 1962: Press Release, 11 October 2002, 5:00 pm". ^ Schoenherr, Steven (April 10, 2006). "The Thirteen Days, October 16–28, 1962". Archived from the original on May 15, 2008. Retrieved May 3, 2010. ^ Blight, James G. and Janet M. Lang (2012). "The Armageddon Letters: Kennedy, Khrushchev, Castro in the Cuban Missile Crisis". Lanham, Maryland: Rowman & Littlefield. ^ Taubman, William (2004). Khrushchev: The Man and His Era. New York: W.W. Norton & Company. p. 573. ^ Jim Hershberg (Spring 1995). "Anatomy of a Controversy:Anatoly F. Dobrynin's Meeting With Robert F. Kennedy, Saturday, 27 October 1962" (5). Retrieved May 29, 2012. ^ a b Faria, Miguel A. (2002). Cuba in Revolution: Escape from a Lost Paradise. Macon, GA: Hacienda Pub. ^ Glover, Jonathan (2000). Humanity: a moral history of the twentieth century. Yale University Press. p. 464. ^ Schlesinger, Arthur (2002). Robert Kennedy and his times. Houghton Mifflin Harcourt. p. 1088. ^ Garthoff, Raymond L. (July 1988). "Did Khrushchev Bluff in Cuba? No". Bulletin of the Atomic Scientists. pp. 40–43. Retrieved January 25, 2011. ^ William Taubman, Khrushchev: The Man and His Era (2004) p. 579. ^ a b c Ignacio, Ramonet (2007). Fidel Castro: My Life. Penguin Books. ^ a b "Arms Control Association: Arms Control Today". ^ Allison, Graham (2012). "The Cuban Missile Crisis at 50". ^ a b c Matthews, Joe. "Cuban missile crisis: The other, secret one". BBC News Magazine. Retrieved 13 October 2012.